Balance, harmony, and poise, this very special ring has undeniably feminine grace. Sculpted from rich 14 karat white gold, the shank's symmetrical bypass design features satiny highlights of brushed gold. One luminous 6X4 mm oval-shaped sapphire gemstone and two pretty, prong-set diamond accents (weighing .03 ct tw) twinkle colorfully above. 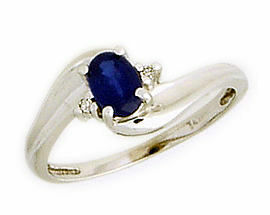 Wear this lovely ring and feel its elegant poise become your own. Diamond Color H-I, Clarity I. We guarantee our 14K White Gold Sapphire Gemstone and Diamond Wave Ring to be high quality, authentic jewelry, as described above.